There are so many simple ways you can play with your baby and promote motor development at the same time! As a physical therapist, I am always looking for different ways that I can promote motor development with play. 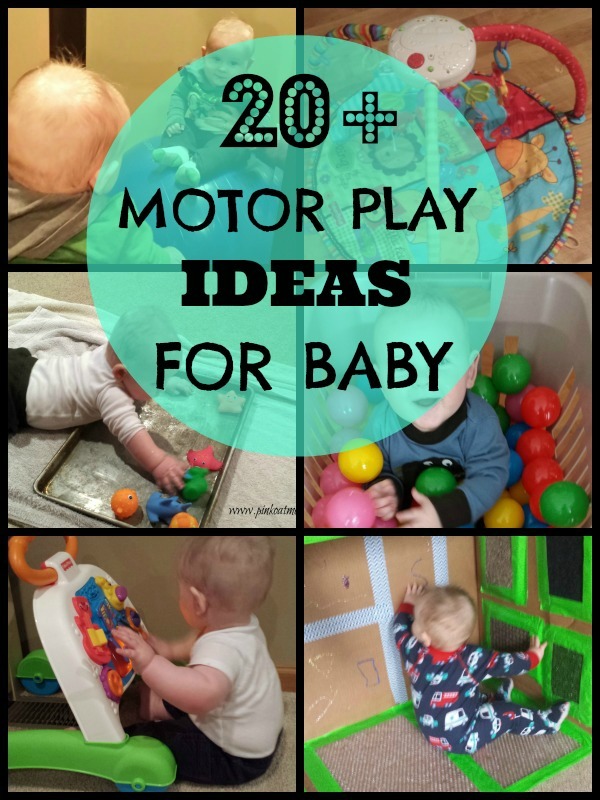 Here is a list of over 20 great ideas for motor play with baby. This is an absolute with all babies. Tummy time is essential for motor and sensory development in our babies. Here are some great tips to make tummy time a little more tolerable. At Pink Oatmeal a great time to get some reading in! At Mama OT using an exercise ball! How about make your own roll for tummy time from Your Kids OT! How about incorporating a little art into tummy time play from Handmade Kids Art. Playing with a ball isn’t just for big kids. There are tons of benefits to ball play with your baby as well. Here are a few ways to get you started on playing with the ball! Let baby play on your exercise ball from Pink Oatmeal. So many benefits to rolling the ball to your baby from Mama OT. How about ball push-ins or rolling the ball down a ramp from Therapy Fun Zone. For your older babies make your own ramp to roll the ball from Danya Banya at Childhood 101. Then there are always the ball pits and all the opportunities it provides for babies to roll, push and grab at the balls to promote motor play. Want to know what equipment promotes motor development in babies? Sometimes baby equipment isn’t always the best for promoting motor development in baby. Some equipment can actually do the opposite. Below are some great ways to use “baby equipment” to promote motor development. Check out the activity table and all the ways that it promotes motor play at Pink Oatmeal and more ideas as baby grows at Mama OT. The baby gym is an excellent choice for all the different ways to promote motor play. The push toy is another great option and it’s not just for walking! All you need are poms and a water bottle for this fun fine motor activity at Mama OT. Pulling ribbon from a tennis ball can to promote fine motor skills for baby at Therapy Fun Zone. Take a tissue box and milk caps for this fine motor activity from Learn with Play at Home. Is your baby starting to crawl? Try out the Sensory Crawl from Dirt and Boogers to encourage gross motor movement with the added sensory benefit! The Demolition Derby is a fabulous idea which gets baby moving by knocking over small towers at Creative Playhouse written by KZ and me! How about an obstacle course to challenge your crawling baby and promote motor skills from Teach Me Mommy. Babies can enjoy water play too, but make sure they are supervised! Something as simple as bubbles encourages motor play for babies. How about using a big cardboard box full of items to touch for baby to come and go as they please combing the motor experience with sensory play! Playing with a balloon is a simple activity that promotes gross motor play for baby at Dirt and Boogers! Be sure to stop by my Facebook page and let me know what your favorite motor play idea is for baby! Continue to stop by Pink Oatmeal for many more motor play ideas! Looking for more ideas on play for baby? Thanks for linking to us, Chanda! And, for posting on Movement Monday.